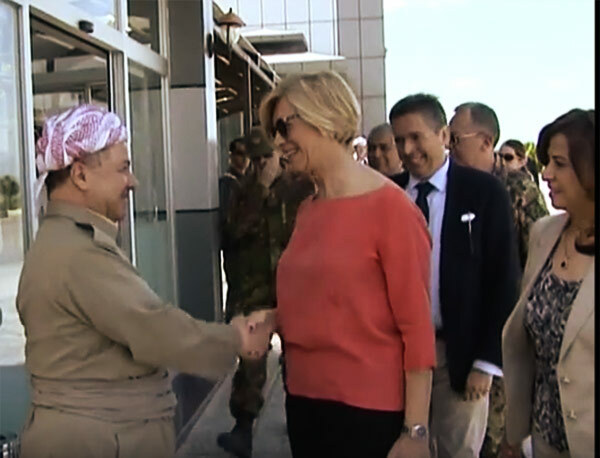 President Masoud Barzani received an Italian military delegation headed by Ms. Roberta Pinotti, the Minister of Defense, accompanied by the High Represenative to Italy, Mrs. Rezan Kader. The meeting was attended by a number of military officials from Italy as well as military and security officials from the Kurdistan Region including, the Chief of Defense General Staff, Gen. Claudio Graziano and the Chancellor of the Kurdistan Region Security Council, Mr. Masrour Barzani. President Barzani reiterated his appreciation to the allies for their support to the Kurdistan Region for their efforts in the fight against Da’esh. President Barzani also noted that the Peshmerga forces have liberated the majority of the areas previously controlled by the terrorists . It’s no coincidence that Italy, for its contingent, is the second nation within the international coalition. The meeting was also an opportunity to discuss the upcoming start of the Mosul dam operations, held by the Italian company Trevi, and will see the commitment of 450 Italian troops to protect the construction site until the dam will not been made safe.